I’ve been hanging out with a large ‘set’ of designers – the official term – this week, and it’s been a timely reminder of the good and not so good things about starting out. As I get more experience, and think about the industry as a whole, it seems design can feel like a Lion King-style “Circle of Life”. You graduate, you assist, you do fringe shows on the side. And then you’re a working designer, and you start to think of helping those starting out on the next cycle. Okay, the lack of lions trampled to death by bison could be where the analogy falls down. This model for being a designer works well: assisting is a way of making money while learning on the job and can be a very nurturing experience. The ladder is passed down, as the next generation steps, blinking, into the sun. Over the years, my peers and I have assisted many people. The experience has often been valuable, but not all the stories are good. From the friend who received comments deriding her “frumpy” clothing to the designer who tried to poach a job his assistant wanted, by going straight to the director. We have all heard stories, and it is clear that the industry has its fair share of problems. 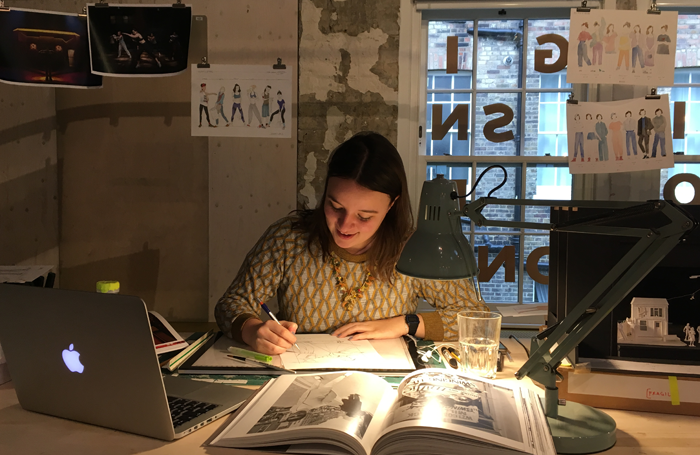 Those starting out as theatre designers can be intimidated – the first few steps on the career path can feel like entering the lion’s den. How absolutely wrong that is. I recently took part in Tom Scutt’s brilliant Donmar on Design festival, where I’ve been talking to design students. At the festival, the students were invited to ask us professional designers any questions, however icky. There were moments when even I took a mental note of the answers. The students were enthusiastic, the designers open and honest. The conversation felt valuable. It made me think about the significance of cross-generational conversations and how designers can sometimes be remote. We all have so much to learn from each other. I left feeling incredibly positive, empowered and proud of how friendly a set of designers can be. I hope the students learned stuff too: there was gold in there for any up-and-comers paying attention. Another thought-provoking moment this month was attending the announcement of the latest Linbury Prize. Regular readers will know I was lucky enough to win that prize last time around. I was nervous about going. After a few “you has-been” jibes from the seasoned old guard, I was introduced to the new overall winner Basia Binkowska. I congratulated her on her wonderful design and we chatted about her work. I saw a look of fear and excitement in her eyes that I remembered from the year before. Suddenly, I realised why I was there: I’d been sent back in time to remind her to breathe. It’s easy to forget the things we needed to know and what we have to learn from each other, whether it’s practical knowledge, being honest about the issues or letting those starting out know that there is a sense of community in our set. Richard Jordan: It’s easier now to apply for roles, but is that causing problems for producers?